Gibberish (sometimes Jibberish) is a generic term in English for talking that sounds like speech, but carries no actual meaning. I am sorry that more gibberish has been thrown by an NKT web site specifically set up to demean this web site, www.nktworld.org, and that my essay a couple years ago has recently been equated with the body of essays and editorials on www.nktworld.org by NKT's web site, http://puremindpureworld.wordpress.com (many of the essays appearing on www.nktworld.org were written by NKT members). "NKTWorld.org repeatedly questions the NKT and Geshe Kelsang Gyatso on a number of doctrinal issues, but I would wager that it is actually Buddha's teachings in general that NKTWorld.org has issues with..."
I cannot find basis for the claim that www.nktworld.org has issues with Buddha's teachings, which are generally trashed by NKT. It is false to assert that anyone awarded Kelsang Gyatso the Geshe degree other than Kelsang Gyatso. Incidentally, NKT's Shugden contrivance and battle exist nowhere in Buddha's teachings. "I wonder whether NKTWorld.org is as well-read as they would have us to believe." I doubt that any web site could be considered well read. "NKTWorld.org does not substantiate its assumption of the correct meaning of Nagarjuna's quote beyond referencing its literal wording." I wrote the essay, not NKTWorld.org, a web site of essays from at least dozens of contributors. I made no assumptions begging substantiation. Readers can make up their own minds about whether my essay provided more or less support for its analysis of Nagarjuna's teaching, misquoted and distorted by Kelsang Gyatso and now attempted to be rationalized in an NKT web site critiquing my essay from 2 years ago. The new NKT gibberish involves Kelsang Gyatso's teaching, an alleged-but-distorted quote of Nagarjuna and now its attempted rationalization in an NKT web site. "By meditating on love for just one moment we accumulate more merit than we do by offering food to all living beings three times every day." He did not. My essay presented what he actually said. According to Kelsang Gyatso then, meditating on love (not actually living it) for a moment surpasses the merit of enabling the existence of all living beings. Right now, there are trillions of living beings. 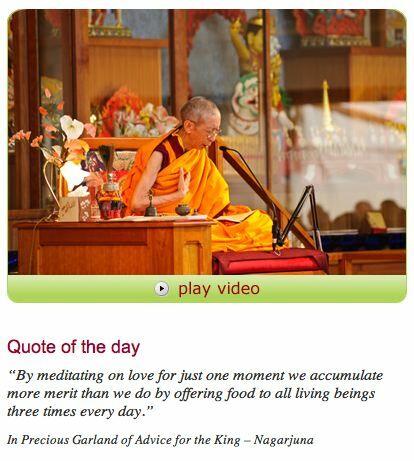 Kelsang Gyatso has the audacity to say that it is better to think about love for a moment than to enable our existence. Furthermore, Kelsang Gyatso has the audacity to claim that Nagarjuna said so as well. Kelsang Gyatso is wrong on both counts. Without food, all living beings would die. No one would be left to love anyone, there would be no one to love. Possibly, this is the world that NKT seeks. Certainly, NKT's protest rallies and Internet attacks do not promote love. The NKT web site challenges my essay by quoting various Lamas about love. I agree with those teachings. However, they are irrelevant to Kelsang Gyatso's distortions and my essay, 'Be Careful with NKT's Quotes', a title as meaningful today as when I initially offered it. A year ago, the NKT web site created to dispel the 'many misconceptions' alleged to infect this web site promised substantial purportedly-corrective commentary. To date, 4 'corrective' essays have been published (compared to about 300 essays and editorials here) - 2 during May 2010, 1 in November 2010 and 1 in March 2011. "I would wager that it is actually Buddha's teachings in general that NKTWorld.org has issues with..."
If we were also gamblers, we would match that wager. We agree with you. Kelsang Gyatso neither quotes accurately nor lives by the teachings of Nagarjuna. Neither Nagarjuna nor Buddha Shakyamuni (nor Tsongkhapa) discussed or worshiped Shugden. Shugden was invented for political purposes hundreds of years after they lived. 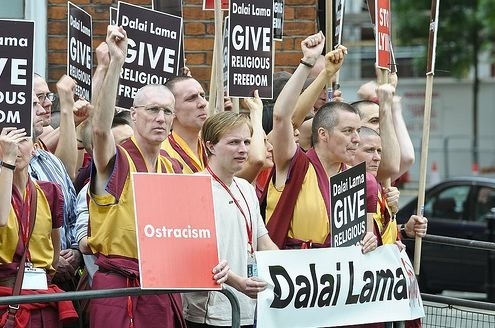 Kelsang Gyatso invented a variant of Shugdenism in England during the 1990s for his lucrative western business plan and to rationalize his battles against Tibet and Tibetan Lamas, and ultimately against Buddhism. We also believe that it is far better to practice love than to merely think about it and that practicing love is infinitely better than selling nirvana the way that NKT does. "It's more meritorious to continue to provide conditions to support samsara than it is to create the causes for people's liberation? I don't think so." "The author of NKT World sadly, and obviously, lacks the slightest Dharma wisdom. This person has no real understanding of emptiness, karma, changing suffering, love, compassion, bodhichitta, or even what Buddhas are which! For years the image of Medicine Buddha at the bottom of the so called readers essay page was mislabeled as Shakyamuni Buddha. It was only changed because they read a Kadampa blog pointing out the mistake." "The site is nothing but a 'rantathon' for people who have an axe to grind against NKT, but it would be better if the contributors first checked the accuracy of their statements against the Dharma instead of making wild claims out of anger." "NKT World, no doubt, will continue to remind us again and again of their all pervading wisdom and insight, and then claim humility." We disagree that providing the conditions promoting life creates samasara. Life is the vehicle for enlightenment. There is no "the author" of nktworld.org. Many essays and editorials here were written by NKT supporters and representatives of NKT corporate headquarters. Material on this web site was generated by hundreds of authors, not one as various NKT supporters falsely allege. A picture of Medicine Buddha was labeled as Buddha Shakyamuni for a few months (not years as falsely claimed and certainly not attached to such labels). The purported 'label' was not changed based on criticism from an NKT web site. We doubt that either the Medicine Buddha or Buddha Shakyamuni would care. The Medicine Buddha is more like Buddha Shakyamuni than not. They see the forest and the trees. There is little anger hear other than referenced policies, posts and opinions of NKT supporters. We claim neither pervading wisdom and insight nor humility as falsely alleged. Like many of our essayists, we are on a journey - spectacular, wondrous and enabled by life. Again and again, NKT relies on its foundation and tradition of false statements. We urge everyone to reflect upon what NKT is selling and its futility. Our lives are precious and the less we are led into falsehoods, the more profound and productive our lives will be. We urge everyone to live the meaning of the Medicine Buddha. The practice of Medicine Buddha, the Supreme Healer is not only a very powerful method for healing and increasing healing powers both for oneself and others, but also for overcoming the inner sickness of attachment, hatred, and ignorance, thus to meditate on the Medicine Buddha can help decrease physical and mental illness and suffering. We do not understand the vow to help women be reborn as men.